Contributor Dr. Julie Buzby, DVM, CAVCA, CVA is an integrative veterinarian and a Grey Muzzle Advisory Board member. She has published numerous articles on canine health and wellness, and has a new blog, The Buzby Bark. You can also find more of her articles for Grey Matters here. Winston Churchill said, “Never, never, never give up.” For most of life’s challenges, it is brilliant advice. But many of us will face a time when we make an intentional choice to “give up” the fight against saying goodbye to our canine companion. Of course, I am specifically referring to an end-of-life decision necessitated by declining quality of life, rather than a convenience issue. I used to tell my clients, “You’ll know when it’s time.” Dr. Kathy Cooney, founder of Home to Heaven veterinary hospice, taught me to say, “We’ll know when it’s time.” It’s a truer representation of the ideal scenario—the dog’s family and doctor(s) functioning as a team of advocates for the patient. Consider how you want to say goodbye. 1. In my observation, home euthanasias are the least stressful on the dogs and their people. Ask your veterinarian if this is something that can be arranged. If not, pet hospice practitioners offer home euthanasia and may be available in your area. Realistically, being at the veterinary hospital may be your only option, but this doesn’t mean your dog has to sit on a stainless steel table in an exam room, unless that is your preference. I’ve euthanized dogs cuddling with their owners on fluffy comforters on an exam room floor, lying in their owners’ arms in the backseat of their car, and outside in the grass. My goal is to work in the environment where the dog will be the most content. 2. In most cases, it’s standard operating procedure for veterinarians to administer sedation prior to the euthanasia solution, but it’s worth asking your doctor what to expect as the process unfolds. The pre-euthanasia injection relaxes the dog, dulls pre-existing pain, and typically ensures a smooth transition. Who would you want present at the euthanasia? Where would you want it to occur? If cremation, do you want the ashes back? 4. Keepsakes can be a priceless treasure in the grieving process and beyond. * I’ve watched many people instinctually remove their dog’s collar while stroking him and awaiting the final injection. For many dogs, this is upsetting. Their collar is a part of their identity. Most people do take the collar home, but please wait to remove it after the euthanasia. * My clients typically appreciate when I clip a tuft of their dog’s hair for them to save. It’s quick, simple, and painless, and often hair is shaved anyway for placement of an IV catheter or to better visualize the injection site. * Another excellent keepsake is a clay paw print. Many veterinary offices offer these to clients, or the option of stamping your dog’s paw print onto a piece of paper, which can be framed or easily stored. Do you know where the name “Fido” originates? It is from the Latin for "faithful." Think of the Latin phrase (and Marine Corps motto) Semper Fidelis, which translates: Always Faithful. Your dog is loyal at all times. Please reciprocate. If at all possible, even if it means working out of your comfort zone, don’t drop your dog off for euthanasia and leave. I realize this is a personal and emotional issue, so if you opt not to be present, consider at least staying until the sedation has taken full effect. This way, your companion won’t fully perceive your departure. Remember, hearing is the last sense lost before dying. 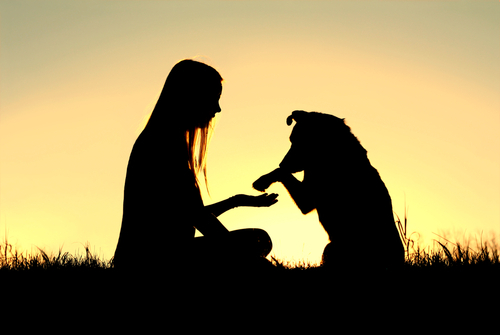 May your dog’s transition be narrated by your familiar voice whispering reassuring words. About the Contributor: After graduating from veterinary school, Dr. Julie Buzby earned certification by the American Veterinary Chiropractic Association in 1998, and by the International Veterinary Acupuncture Society in 2002. As an integrative veterinarian, Julie seeks to blend the best of Western medicine, alternative therapies, and creative tools for maximum wellness in her patients, the majority of whom have grey muzzles. After years of frustration watching her patients struggle on hard floors, Dr. Buzby also developed Dr. Buzby’s ToeGrips for dogs, devices which improve mobility in dogs by providing them with better traction.